Besides adding interest and beauty in a garden space, arbors are designed with open framework and provide a resting place in a garden that is shaded. These designs are usually made of rustic wood or latticework and also serves as a trellis for growing climbing flowers and plants. Trellises and arbors are both great additions to the backyards of a country or Victorian style house plans especially when they are designed with lattice. 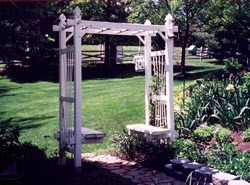 Our collection of arbors and trellis plans features great desings for making your garden stand out from the rest. We offer detailed drawings so building will be simple and easy. With a wide variety of styles, we are sure that you will find the perfect do-it-yourself project to fit your needs.